At the end of their penultimate homestand, the Minnesota Twins left the friendly confines of Target Field with a record of 61-82. With only 19 games remaining in the season, it seems fairly well assured that the Twins will end their fourth straight season with 90+ losses. Speculation and debate over potential organizational change will run rampant. And Twins fans will spend another off-season wondering when their favorite team will manage to climb their way out of baseball's cellar. In the modern American classic, “The Shawshank Redemption”, we hear Tim Robbins as Andy Dufresne deliver perhaps the quintessential line of the movie in voice-over form. And really, when you boil baseball down to it's base elements, “hope” is what America's Pastime is all about. Each season 30 fan bases begin with the dream of a parade late that year. In reality maybe 12-15 of those fan bases may have a legitimate shot at the start of the year, and only 10 of them will be granted an opportunity at post-season glory. So what about the rest? If intellectually, you know your team has little to no chance of competing for a title when the season begins, why do you buy tickets? Why do you buy merchandise? Why do you go to the ballpark? Why do you watch on TV or listen on radio? The answer is simple: hope. Baseball, like life is cyclical. If things are good now, it's best not to take them for granted, because it won't always be this way. If things stink at the moment, be patient and persevere because better times are likely to come. As was mentioned earlier, the Twins find themselves decidedly in a down-cycle. In fact, it's a historically bad down-cycle. The franchise has never in its history finished four consecutive seasons with 95+ losses, as it's currently threatening to do. The last time it finished 4 seasons with 90+ losses was in a stretch from 1997-2000, but lost 95+ only one of those seasons (1999). Prior to that you have to go back to the 1955-59 Washington Senators to find a stretch of futility even approaching what the Twins have put together of late. So in the face of such gross ineffectiveness, what hope is there for Twins fans? Why should they even bother coming to the ballpark for the approaching final homestand of 2014? Well in baseball, hope usually takes the form of young players. And while the cream of the Twins prospect crop isn't here yet, several players who could play key roles on future clubs are here now and September is their chance to gain experience and prove whether they truly do fit into future plans or not. Danny Santana has been with the team since May, and while his batting average on balls in play (BABIP) is unsustainably high (.391) and his walk percentage is frighteningly low (4.7%), he's filled a couple of key roles for the Twins. First, he's been a fixture in the leadoff spot, amassing a slashline of .320/.358/.475 with 15 stolen bases and 57 runs scored. Second, he's played solid – if not spectacular – defense in center field. A position which isn't his natural spot (he's a shortstop), but one that the Twins have been unable to fill on a regular basis since trading Denard Span and Ben Revere prior to the 2013 season. Santana has a shot to be an everyday shortstop in this league, but even if his ceiling turns out to be a super-utility player, he'll bring plenty of value to the Twins in the years to come. Kennys Vargas has been the apple of many a Twins fan's eye over his first 36 games in the big leagues. 15 extra-base hits and 33 RBI in your first 152 at-bats will do that to a fan base. Like Santana, Vargas is riding the wave of a high BABIP (.358) and his walk percentage is even lower than Santana's (2.5%). So assuming those numbers normalize a little bit (and given that the only defensive position you dare play him at is currently blocked by $23 million), Vargas is unlikely to live up to the “Little Papi” nickname some wish to thrust upon him, given his close relationship with former Twin David Ortiz. So maybe Santana gets supplanted by a Byron Buxton at the top of the Twins lineup. And maybe Vargas isn't a long-term solution at the clean-up spot. But one can easily imagine Santana being electric at the bottom of the order, and Vargas slotting in nicely in the 5th or 6th spot behind Miguel Sano and perhaps Oswaldo Arcia. They're not the not the most important pieces, but they are valuable pieces none the less. There are also plenty of other roster questions to be decided. Can Aaron Hicks actually develop into an every-day Major League outfielder? Can Josmil Pinto's defense behind the plate catch up to his offensive skill enough to allow him to stick? Can Trevor May overcome the rough start to his big league career and become a long-term part of the Twins rotation? And it's not just the kids who pose questions for the Twins. Assuming Sano will be serviceable at third base, what does Trevor Plouffe's future hold? A move to the outfield perhaps? Can Ricky Nolasco bounce back from a tough first year of the four-year, $49 million contract the Twins signed him to? Can Brian Dozier take the next step and graduate from “solid every-day major leaguer” to “All-Star second baseman”? The answers to all of those questions won't come quickly, but they'll start to be answered as the 2014 season winds down over the final homestand September 15th through the 24th. Is there hope for Twins fans? There's only one way to find out. Keep watching. The calendar has turned to September. Kids are back in school. Football season has begun. And the Twins find themselves on the wrong side of another lop-sided record. The temptation to turn the page on the baseball season and forego any further trips to the ballpark is strong. But that would be a mistake. It can be argued that there are plenty of reasons to come watch the Twins themselves – arguments which you'll find in this same place later this weekend. But today, the focus is on a reason to come to the ballpark, regardless of how the Twins are faring: to see some of the best players in baseball ply their trade. We were spoiled earlier this Summer when most of the greats were here for baseball's Midsummer Classic. But for those of you who weren't able to find your way into the ballpark for the All-Star Game there are still chances to see some of those same players. And the best part is, this time, the games actually do count. This weekend, the Los Angeles Angels are in town trying to extend their lead in the AL West, and with them comes arguably the best player in all of baseball (not to mention the MVP of the aforementioned All-Star Game): Mike Trout. Trout made his Major League debut on July 8, 2011. All he's done since then is compile a .306/.394/.546 slash-line with 223 extra-base hits, 294 runs driven in, 350 runs scored and 981 total bases in just under 1800 at-bats. He's been an All-Star three times and finished second in AL MVP voting twice. How good are those numbers? Just compare them to the man Trout is most often comped to: Hall of Famer Mickey Mantle. In the Mick's first 4 seasons he compiled a .296/.391/.505 slash-line with 200 extra-base hits, 346 runs driven in, 389 runs scored and 956 total bases in just under 1900 at-bats. Mantle was also a three-time All-Star at that point, but hadn't finished higher than third in the AL MVP voting, and he hit that threshold only once. Give Trout another 100 at-bats and it's likely he will eclipse all of Mantle's numbers from his first four seasons. What separates guys like Trout from the rest of the field, however is the value he adds beyond the bat. Trout's attempted to steal 113 times in his career. Catchers have thrown him out just 14 times. So if he doesn't drive the ball in the gap for a double, he's nearly as likely to turn a single into a double with the strength of his speed. He's no slouch in the field either. Fangraphs has a statistic called “Ultimate Zone Rating” which attempts to measure a players contribution in runs above or below average. For his career Trout is a full 14.3 runs above the defensive level an average outfielder would play at. Baseball Reference calculates forms of WAR (Wins Above Replacement) in both offensive and defensive categories. For his career, Trout's added 1.2 wins above a replacement player for his defense alone. By way of comparison, Mantle wasn't able to get above 0 dWAR until his fifth season in the big leagues. But not all of you are stat-heads, right? So how does this translate for you? Simple. If you want to see a guy hit the cover off the ball, run the bases like he was shot out of a cannon and cover more ground in the field than Alexander the Great, you want to go watch Mike Trout play baseball. All the more so because he seems to enjoy playing at Target Field. 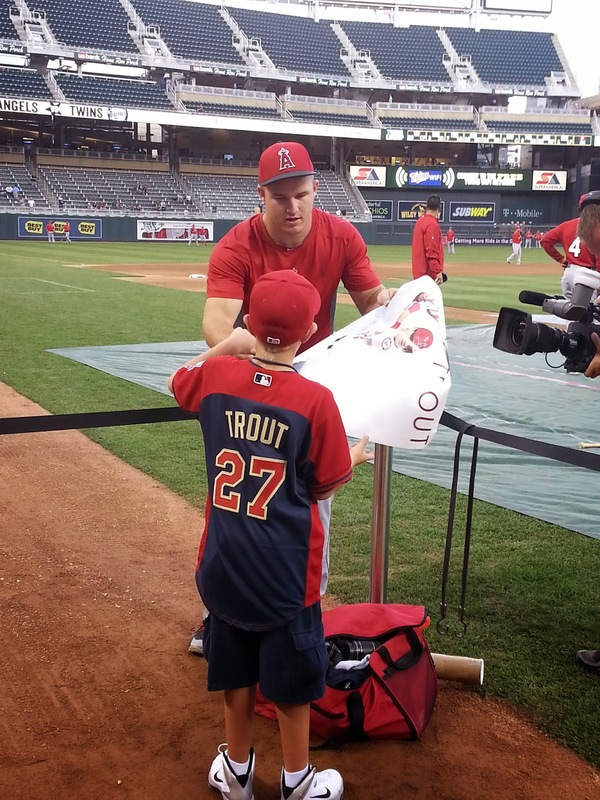 “I love it, the atmosphere is great, and the fans are great,” Trout said. Does he think there's a downside to Minnesota baseball's pride and joy? Perhaps you're not a Trout fan? Possibly you're one of those folks who come down on the Miguel Cabrera end of the AL MVP debate? Maybe you're not sure? No worries, Cabrera brings his Tigers to town one week from Monday. So check out Trout this weekend and Cabrera in a week and decide for yourself. Either way, there are still plenty of reasons to head out to Target Field to watch baseball over the last month of the season.